The New Hampshire primary demonstrated a nightmare for both the Democrat and Republican establishment. I can explain Trump’s victory by realizing that New Hampshire was one of the last to recognize the Martin Luther King, Jr. holiday. However, Sanders’ victory gives evidence to the fact that the Democrat entitlement privilege has dried up in the vote. Let’s look at Trump’s message of “making America great again” that motivated the bones of conservatives. To spread such a message must first imply that America is a disaster. The question is, are Republican voters as against the establishment as this phrase and Trump’s popularity supports? The phrases that seem to be the art of Trump’s message lack any real clear policy positions other than building a wall that Mexico will pay all expenses for. Republicans against the establishment cannot believe that Mexico will pay billions of dollars for a wall to keep illegals out of our country. On the Democrat side of town, Hillary Clinton is realizing that the younger Black vote is not in her back pocket. Younger Black voters, being the Black Lives Matter generation, understand that Bill Clinton was responsible for changes in both welfare reform and criminal laws that have proven to be the greatest harm to Black families from about 1994 to present. Yet, Hillary is crying for help from Brother Bill to help bring in the Black and Latino vote. Bill better bring out his saxophone and visit Black churches. Sanders has Hillary tripping out, winning by 20 percentage points in New Hampshire. This, despite Brother Bill coming out with his scratchy voice, waving his head around in a cool way while asking voters to support Hillary. Sanders’ message to the people is simple yet authentic to young and old, Black and White voter: “Let’s do something about this economy designed for the rich.” He talks about his dislikes for special interests groups and his support of universal healthcare and free college tuition. Sanders is able to bring all these issues back to the benefit of all, but especially Black Americans. I can understand why Congressman Keith Ellison has endorsed Sanders. Young Black Americans, including Black Lives Matter, are witnessing a full “no more as usual” rejection of the political establishment. The proof is that 46 percent of Republicans feel betrayed by Republican politicians. It’s been repeated over and over that a socialist could never win. Well, look at Trump and Sanders. Both have done, thus far, the impossible, America. 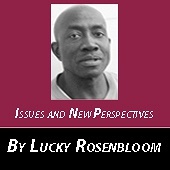 Lucky Rosenbloom welcomes reader’s responses to 651-917-1720, or email him at l.rosenbloom@yahoo.com.